Dec 28, 2016: Best wireless networking option under 50 bucks? Dec 28, 2016: Any recommendations on a good pci wifi adapter for a pc? Feb 18, 2017: Really worth it to use a PCIe wireless adapter? Apr 02, 2017: Ordered BT and WiFi modules for 10.12.4 Hackintosh. Will they work? May 18, 2017: Best wireless internet adapter for gaming? May 22, 2017: What would cause disconnects from Overwatch? May 24, 2017: [Build Help] Upgrading MB/CPU/RAM...enough power? Jun 03, 2017: Looking for criticism of my build or suggestions for a better build in the same vein/budget. Jun 11, 2017: Are there any PCI-Express x1 AC WiFi adapter cards that work with Linux? Jun 11, 2017: Are there any PCI-Express x1 AC WiFi adapter cards that have good support for Linux? Aug 05, 2017: What is the difference between these two wireless adapters? Aug 18, 2017: [Help] Recommendation for Wireless Router? Nov 29, 2017: How do you judge Wifi Adapters? Dec 09, 2017: What are the differences between PCI wifi cards and USB wifi adapters? Dec 31, 2017: Windows 10 Compatible WiFi card? Jan 10, 2018: Are expensive PCIE wifi cards worth it? Feb 27, 2018: TP-Link Archer T9E AC1900 or the TP-Link Archer T9E AC1300 which should I purchase for my HP Compaq Elite 8300 Small Form Factor? May 10, 2018: Wireless Cards - Do they REALLY Make a Difference? May 20, 2018: Which WiFi adapter to get? And some questions about running ethernet. May 31, 2018: Host computer not discoverable on network. Jan 17, 2019: Looking for recommendations on PCIE Wifi Adapters? Jan 22, 2019: Can anyone tell me how this pc would preform... Gaming wise? Jan 23, 2019: Sensible build? Savings potential? Feb 21, 2019: Are there any wifi adapters that are better than this one? 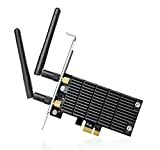 Mar 14, 2019: Is this the best wifi card? Mar 23, 2019: Spacing between graphics card and wifi card small, is this a problem? Apr 07, 2019: My first PC build. Need advice, rates, and more. Apr 11, 2019: H500 vertical mount/ WiFi card conflict? Apr 13, 2019: Building my "little" brothers first desktop pc together, could use some help! Apr 20, 2019: Looking to upgrade from R7000 (AC1900) Netgear router.